Maccabi Australia’s eye to the future has extended to its management team for the 2013 Maccabiah Games in Israel via the creation of a “deputy assistant team managers – junior team” role . The job was created to “head-hunt” an administrator from Sydney and Melbourne to continue the organisation’s focus on renewal for the future. Jessica Goulburn, who plays with Sydney’s Eastside Netball Club, and Josh Burns, a basketball player at Melbourne’s Basketball Club, are the two recipients who will join Junior Team Manager Yvette Shaw’s team in Israel. “I see this as a very important development in the organisation in terms of succession planning and developing future leaders,” Australia’s Head of Delegation Harry Procel said. 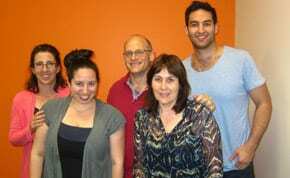 Jessica and Josh will work under Yvette Shaw and her two assistants, Rachelle Gentin and Sam Gamsu. Yvette says that the creation of the role is pivotal and helps show that the Maccabiah Games is about much more than just the three weeks of sport – for both the individuals and national Maccabi bodies that are involved. “I’d like to continue to encourage young people to be involved in the management of Maccabiah,” Yvette said. “The only way we can do that is to encourage young people to come in. I’ve done it in Junior Carnivals and now we’re bringing this model into Maccabiah. “I think it’s really important to give those opportunities – and we need to create those opportunities. Jessica, who has played 16 seasons of Maccabi netball, and has taken on the PR co-ordinator role at the club since 2008, is relishing the chance to combine her love of Maccabi and Israel. “I have loved getting to know the junior netballers and I’m looking forward to getting involved with the development of other young sportspeople,” Jessica said. “It will be so special sharing the Maccabiah experience with so many up-and-comers. I have also loved my involvement with the netball club committee for the past four years and would love to expand my involvement with the organisation. 24-year-old Josh, who has played basketball with Maccabi since he was seven, and won a gold medal at the 2010 MAIGS, wants to help provide juniors with the same thrill in 2013 that he received when he participated in 2005. “I still remember walking into the opening ceremony and hearing the roar of the Australian fans. The whole experience was brilliant. It made the hard work worthwhile,” Josh said. “I like the team environment. I enjoy working with kids and schools, and although it can be challenging, I get to work for an organisation that has given me a lot in my life. Both Josh and Jess hope that their age will be an asset for the management of the junior team. “It’s good to get a bit of youth in the team, someone they can relate to, someone positive, someone they can speak to, someone who won’t remind them of their parents, someone they can trust. Hopefully I can play that role,” Josh says. Harry and Yvette are thrilled to have the duo on board, and Yvette adds that it shows that Maccabiah, and involvement in Maccabi, can extend well beyond the field or track. “It shows if you love sport, here is a different way for you to engage.